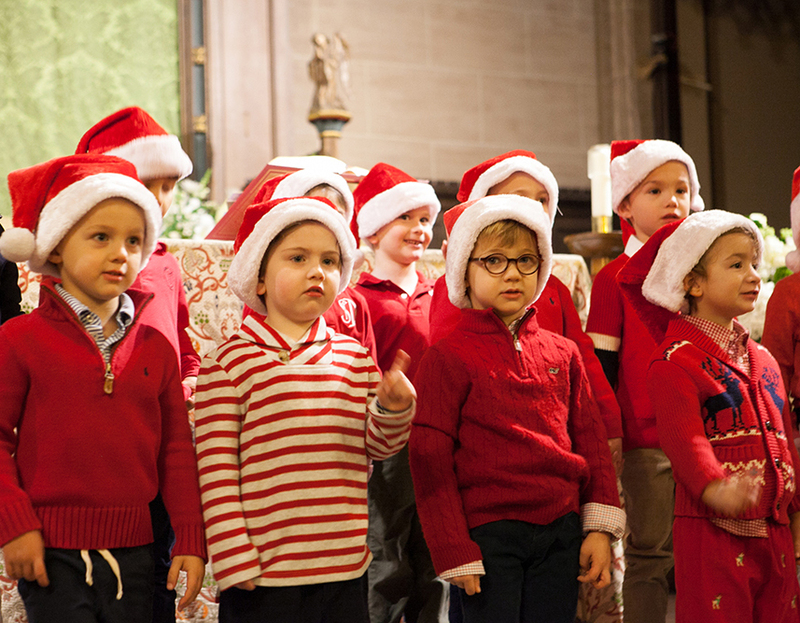 Yesterday began and ended with two of our community's cherished Christmas traditions. The morning's First Grade Pageant featured our young boys re-enacting the Nativity through dialogue and song. 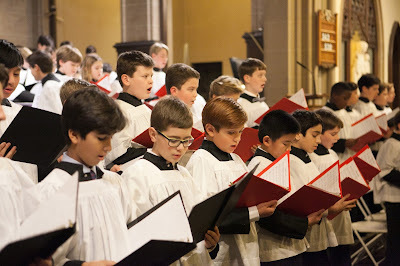 They sang each classic carol, including the Spanish Pastores y Reyes, with feeling and confidence, and concluded with a rousing Joy to the World. 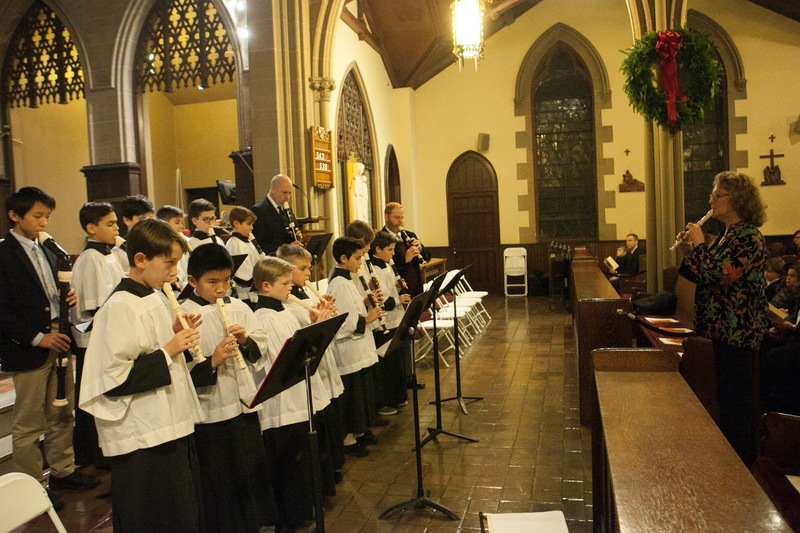 The evening brought us to St. Thomas More for the Advent Service of Lessons and Carols, beginning with a Recorder Consort, directed by Susan Iadone and featuring several of our alumni recorder players. 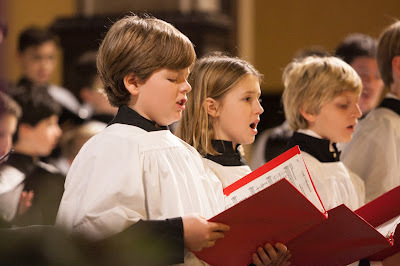 During Lessons and Carols, scripture readings and carols beautifully rendered by Phyllis Clark's fifth and sixth grade chamber singers, filled the church with warmth and meaning. These are such meaningful ways to celebrate our community and what we most value during this festive time of year. As always, gratitude to Music Chair Jeff Moore, Choral Director Phyllis Clark, Religion Chair Jim Barbieri, and Recorder Teacher Susan Iadone for bringing us this meaningful event. 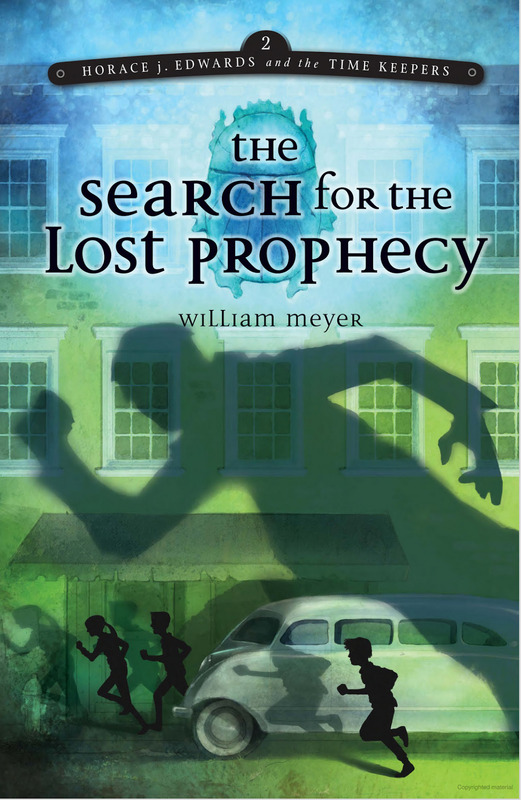 Author and Educator William Meyer visited our fourth graders last week to talk to them about his Horace j. Edwards and the Time Keepers series. The first book, The Secret of the Scarab Beetle was inspired by his interest in Ancient Egypt and the mystery surrounding King Tut's tomb. His recently published second book, The Search for the Lost Prophecy, continues the adventure of the protagonist, but is set in 1920s Detroit. 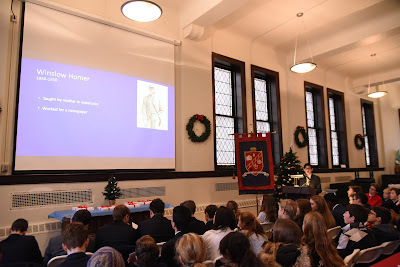 The boys have been learning about Ancient Egypt in history, and were captivated by Mr. Meyer's presentation, especially when he talked about curses and ghost stories! The PA Author series provides our boys with the invaluable opportunity to interact with and be inspired by a published author. 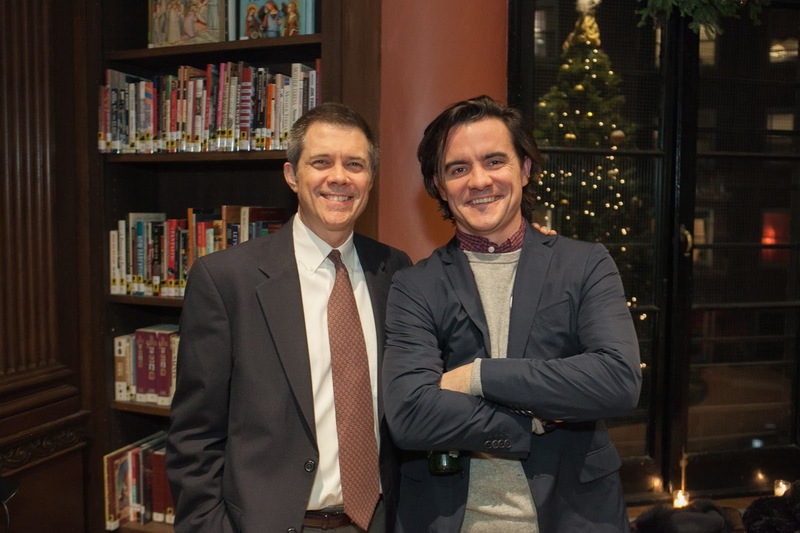 For his in-depth analysis and compelling presentation of The Army of the Potomac by Winslow Homer, Nicholas R. was named the winner of the 2017 Nightingale-Bamford Lectures on Art. Friday marked the 25th anniversary of the competition, originated by Fourth Headmaster Dr. Donald T. Maiocco. 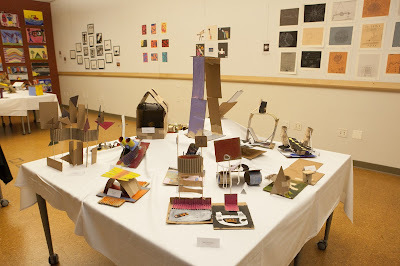 It is one of four major summary projects that the Eighth Grade boys complete in their humanities course. 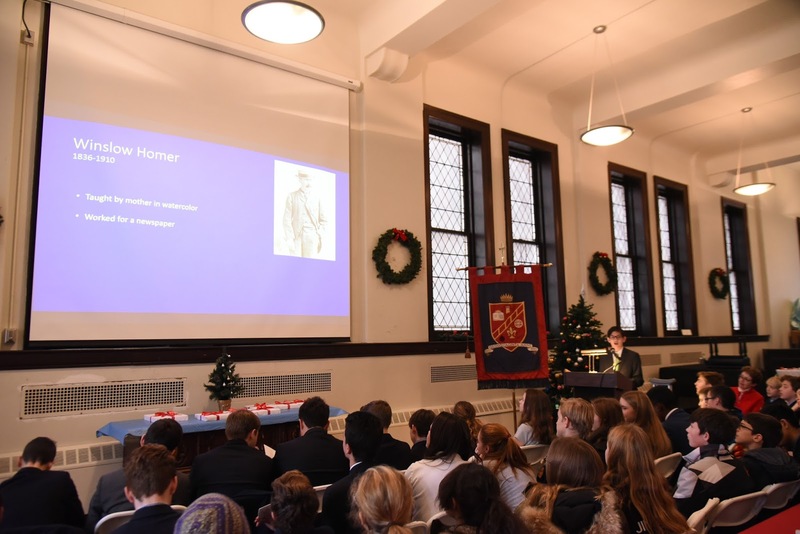 Each eighth grader researches a notable work by a renowned artist, then delivers a lecture and PowerPoint presentation on the artwork. 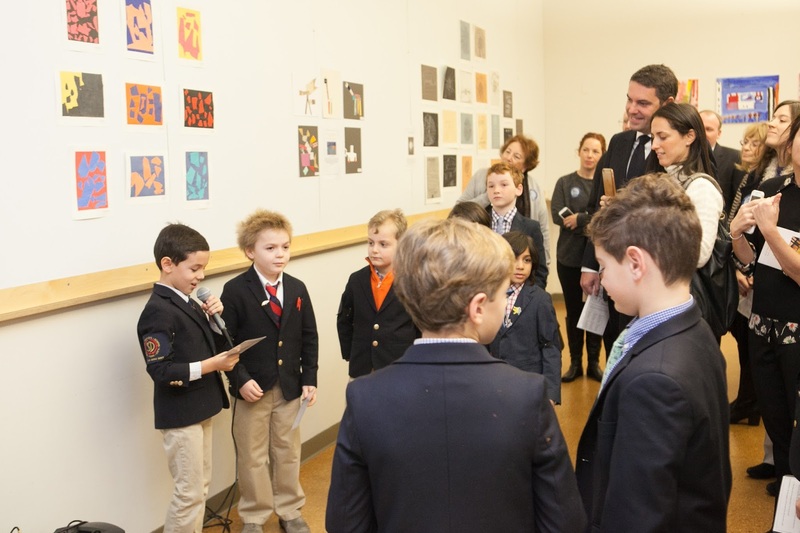 The lectures are judged, by a panel of educators and experts in art, on the depth of the boys' analysis and research, their oral presentation skills, and the visual design of their slides. Congratulations to Nicholas and finalists Charlie C. (Self Portrait by Vincent van Gogh), Harlan S. (Panel for Edwin R. Campbell No. 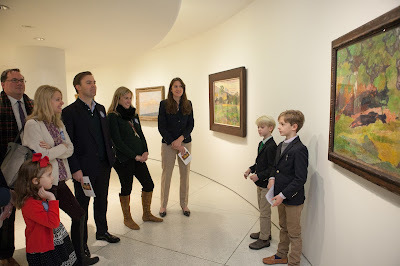 4 by Vassily Kandinsky), Matthew S. (The School of Athens by Raphael Sanzio), Declan O. (The Creation of Adam by Michelangelo Buonarroti), and Pierce E. (Several Circles, No. 323 by Vassily Kandinsky). 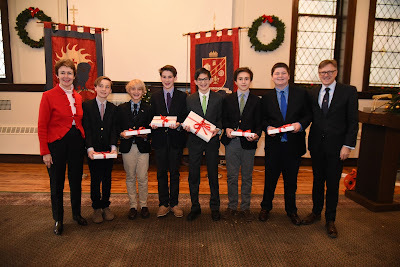 Each boy delivered an outstanding lecture that demonstrated mastery of the work studied and oratory skills honed under the guidance of their teacher and Art Historian Nancy Iannicelli. This interdisciplinary project is representative of the classical ideal of balance at the heart of a Saint David's education; and is a lasting legacy of Dr. Maiocco's vision. Look, Imagine, Create: Collages, Painting, Drawings, and Constructions was the hottest ticket at the Solomon R. Guggenheim last week; and it featured our second graders. 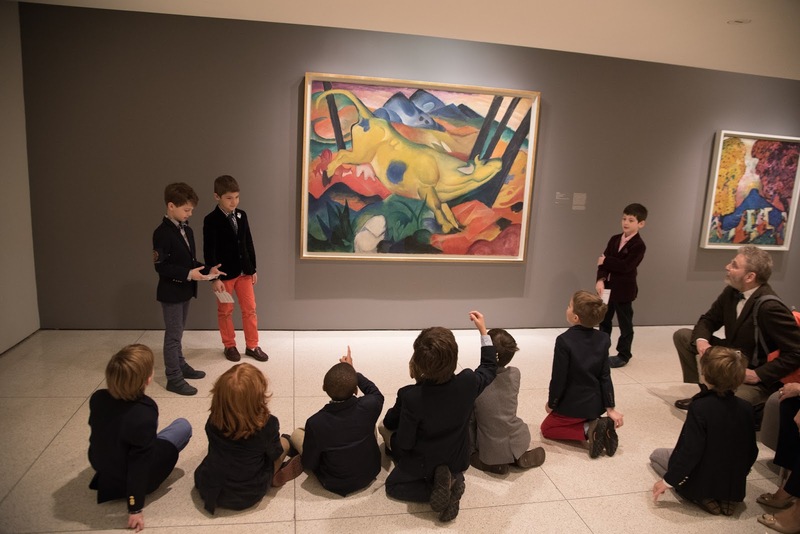 Under the guidance of art teachers Melanie Fidler and Hannah Frassinelli and museum educator Hollie Ecker, the boys spent their fall art sessions at the Guggenheim where they studied the iconic architecture of the building as well as several modern masterpieces from the Thannhauser Collection. In the art studios, they created works in various media, including collage, painting, drawing and construction, inspired by the masterworks they had studied. During the student-led gallery tours for their parents, teachers, and first graders, the boys confidently delivered their talks, sharing what they had learned about artists' use of line, shape, color and texture, abstraction, attachment techniques, and materials. 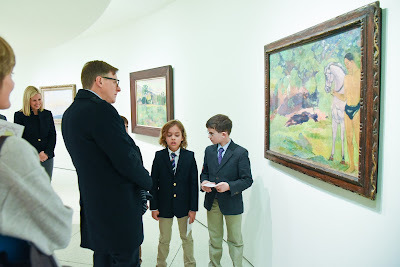 Afterward, all were invited to an exhibit of the boys' own artwork on display in the museum's art studios, where the boys revealed their motivations and the artistic processes they used. This is the second year of our partnership with the Guggenheim. The collaboration provides the second graders with access to the expertise of museum educators who work closely with the boys' art teachers to create a dynamic learning experience. Throughout our program, we are strategically leveraging New York City's world renowned scientific and cultural institutions as an extension of our campus. 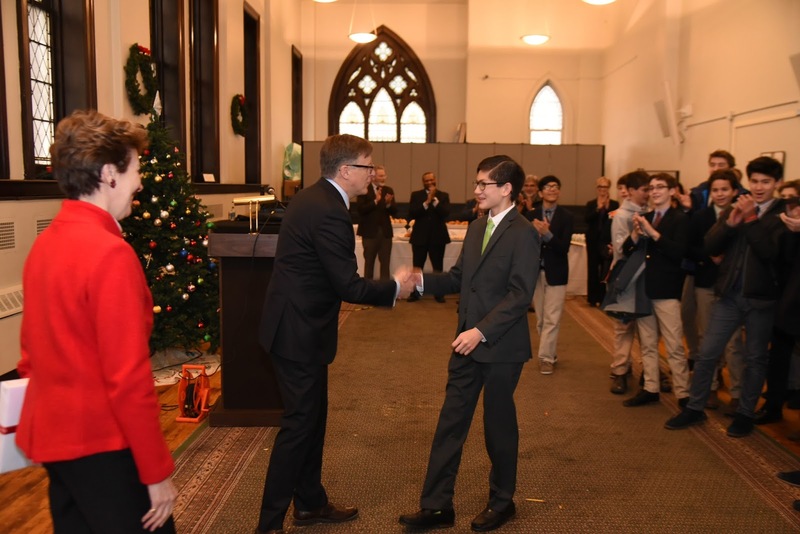 Christmas is made most special when members of a tight knit community come together to celebrate their history, shared values and friendship, and to wish one another well. 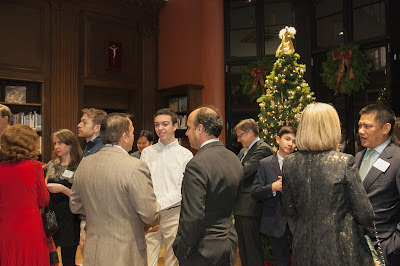 Yesterday evening our alumni and alumni parent community and many of our faculty and staff gathered to celebrate the Christmas Season with each other. 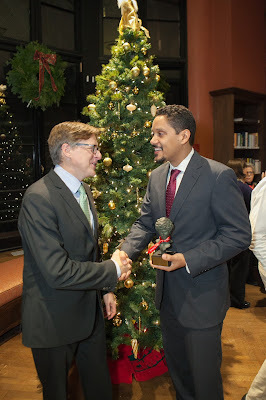 The evening included presentation of the Alumnus of the Year Award to Miguel Sanchez, Class of 1997. Miguel has been a dedicated member of the alumni community and an integral participant in the school's annual Prep for Prep Alumni Panel, having served as a panelist more than any other alumnus. 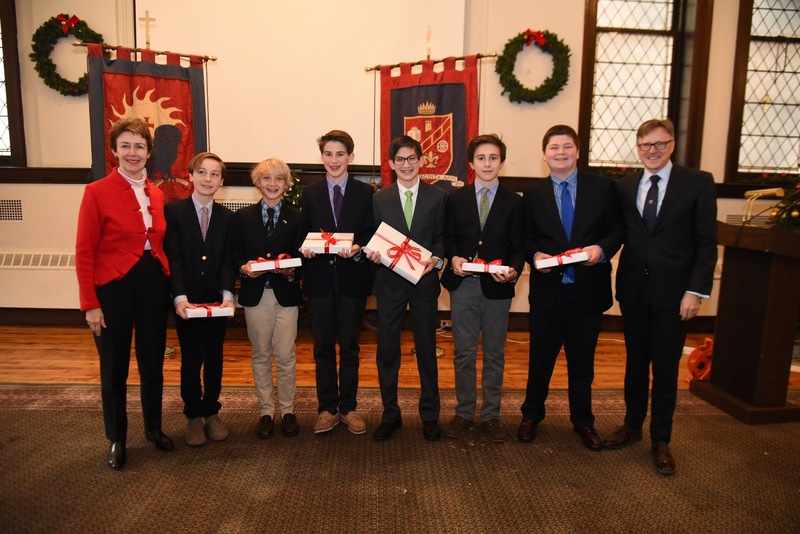 The panel meets with sixth graders in the spring, in advance of their welcoming a Prep for Prep classmate in the fall of seventh grade. 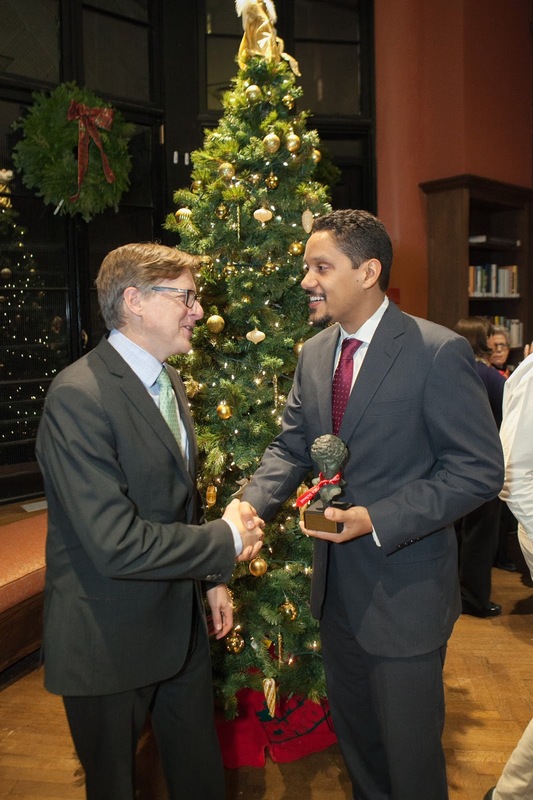 Miguel is an alumnus of Prep for Prep, a Gates Millennium Scholar, and a Robert Toigo Fellow. He earned an MBA from Harvard Business School and an A.B. in Government from Harvard College. 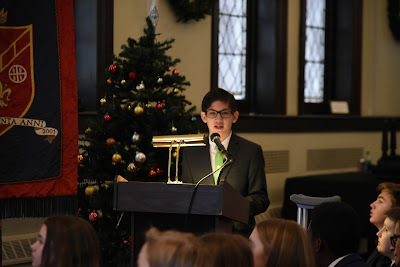 In accepting the award, Miguel spoke of his fondness for Saint David's and his desire to give back to the school in appreciation of his teachers. He also thanked his parents for directing him to Saint David's School in the first place, noting, "My mother knew what I needed in order to grow into the good man my parents hoped I would become." It was so good to see Miguel and his family and to have the opportunity to thank him for him for his continued commitment to this school. 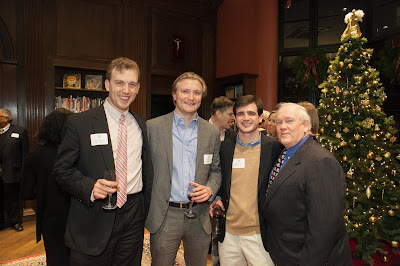 In all of our conversations, it is always clear that he cares deeply about Saint David's and our mission. Yesterday morning, our First Orchestra musicians treated their parents to a before school cocoa concert, an open rehearsal led by director Carla Francis. 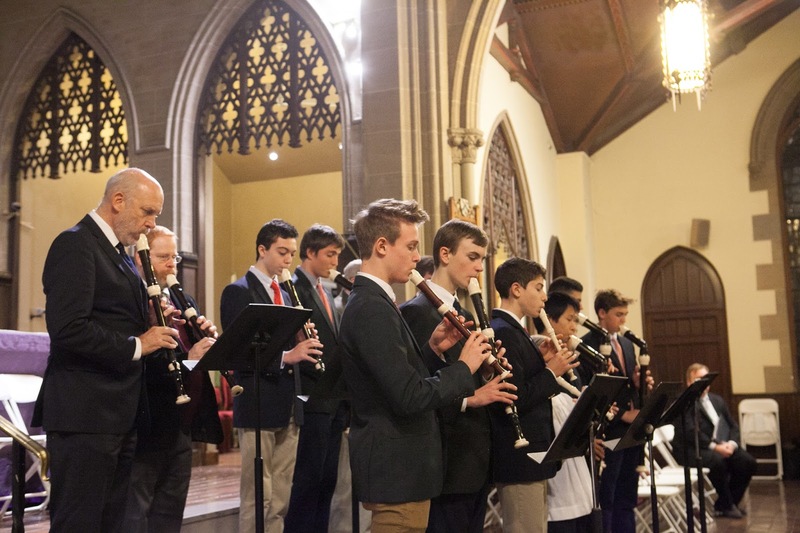 Saint David's First Orchestra program, now in its fifth year, provides an opportunity for violin and cello students in Grades One through Three to experience playing together in an orchestra setting. They perform twice during the year in concerts for their fellow classmates. 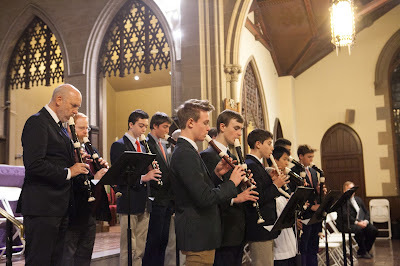 First Orchestra is a prime example of the school's commitment to the arts and aesthetics, one of the four pillars of a Saint David's education, and it also builds the confidence of our younger boys as they gain comfort performing and speaking in front of an audience of parents and peers. Our school's remarkable, unique partnership with the American Museum of Natural History - Hayden Planetarium kicked off its fourth year last Friday, when our sixth graders spent the morning at the museum for the first session of the Digital Universe Field Study unit. 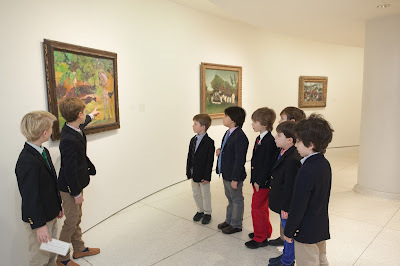 The interdisciplinary study blends English, science and technology curricula, and is conducted both at the museum and in the boys' science and English classes at school. Boys explore distance and size of planets in our solar system, using clay. Over the next three months, the class will regularly visit the AMNH, working with the museum's astro-visualization team to master proprietary Digital Universe software that will enable them to simulate "flying through" the universe, using real-time astronomical data. Working in pairs, they will take this knowledge, as well as their learning about space in science class, and narratives in English, to explore an astronomy-related research question of interest and create a space show presentation that they will present to parents in the dome of the Hayden Planetarium. 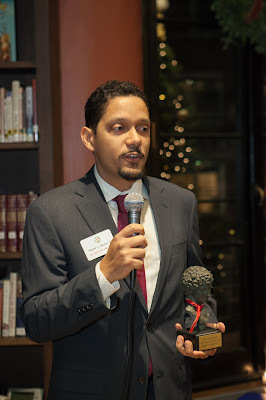 This is truly a one-of-a-kind partnership with the AMNH; unique in its ongoing collaboration with the museum's experts and in our boys' private, continuing access to the planetarium and the Digital Universe software. Boys learn best when they can benefit from the expertise of industry experts as well as their Saint David's teachers, and when their learning in and out of the classroom enables them to pose questions that require critical thinking and analysis. 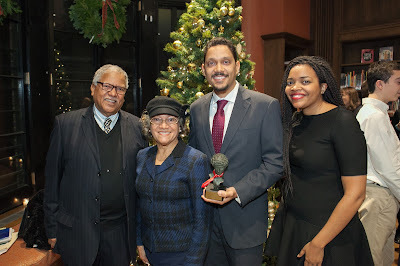 Our DUFS partnership does this, all while allowing our boys to take flight through our solar system and beyond. Who could ask for more? Christmas Carols sung by our Pre-K, Kindergarten and Omega boys filled St. Thomas More on Friday, where we held this year's Grandparents and Special Friends Day program. 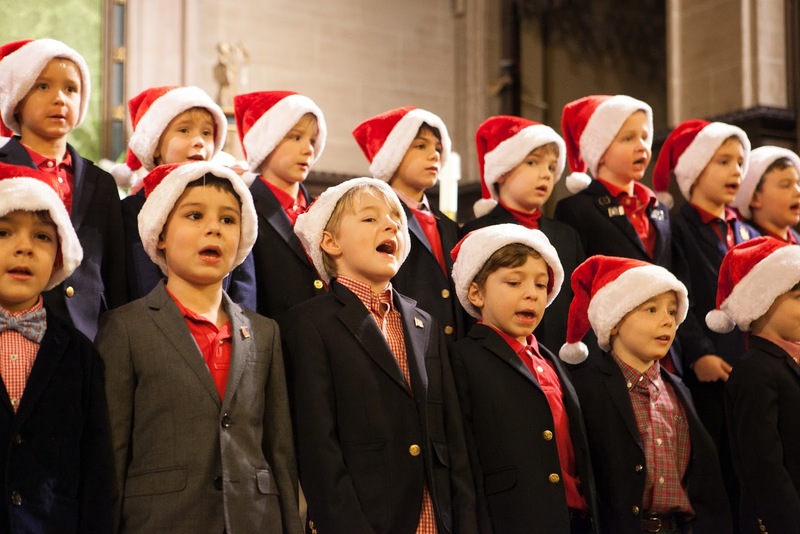 Our youngest boys have been practicing hard for weeks with Music Chair Jeffrey Moore to nail the melody and rhythms of classics that included I Saw Three Ships and Rudolph the Red-Nosed Reindeer. 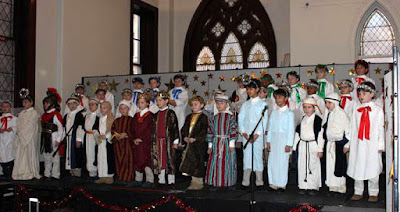 Their repertoire also featured a traditional Spanish Carol, and the opportunity for all of us to sing along to some favorites. Experiencing the holidays through the eyes and voices of our youngest boys was a joy for us all. It was so good to see so many of our boys' grandparents present. 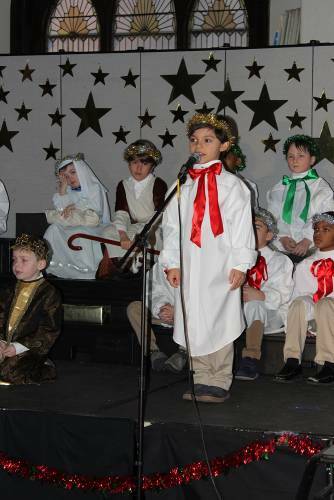 Our school's mission celebrates family; and the impact of grandparents on our lives is extremely special, a loving bridge to our past and our future.